Proud Sponsor of the Famous "Andre Pegues Alcohol Funny Car" Dragster! Congo Pools offers an affordable, easy to install family above ground swimming pool that will provide many years of fun and laughter. Congo Pools are a huge value! Don't be fooled by Internet companies selling cheap imitation pools with inadequate equipment! OVAL POOL PACKAGES "Summer Sale"
Congo Pools offer more than just a good time in the sun. Congo Pools are great for recreation, family fun or exercising, such a lap swimming. The portability of Congo Pools also makes them easy to install, maintain and take down for moving or storage. When it is time to move the pool, you simply reverse your steps and the pool folds up into a small bundle that can easily be carried away or moved to another location. We are confident that you will find the Congo Pool the easiest setup of an above ground pool in the market today. Congo Pools are built with a strong industry leading reinforced vinyl with a multi-directional woven fabric. Also the support structure is constructed of strong steel that is powder coated for maximum durability and safety. If you're shopping for a soft sided above ground pool be sure to compare the Congo Pools price and quality before you buy any other pool... We're very confident you'll quickly recognize the superior design and quality offered by Congo Pools. 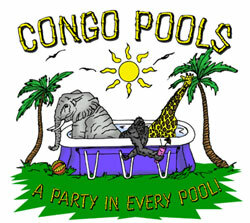 Congo Pools are inexpensive and are a great value. You will have many years of family entertainment with your Congo Pool. Congo Pools offer the utmost safety margin because these pools are user friendly. They have no sharp edges or rough corners, which greatly reduces the possibility of injury. The following equipment is available as an upgrade. If you have any questions, about whether or not this equipment is right for you please contact us. We are here to help you determine the pool that will best fit your needs. Our customer service reps are trained in above ground pool heaters, automatic vacuums, filters, pumps and motors and are willing to answer those tough swimming pool questions. Contact us today!